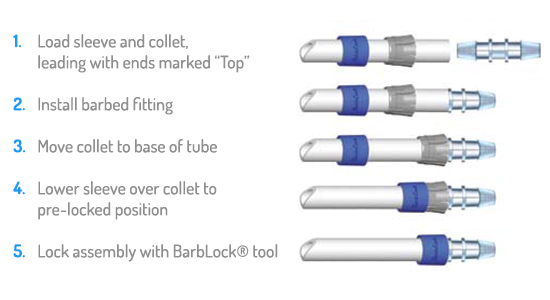 The BarbLock ultra secure retainers are designed to fit perfectly with Saint-Gobain's market-leading hose & tubing. 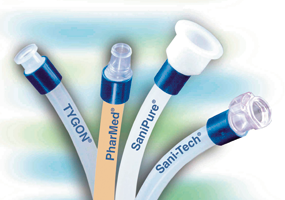 We can supply the extensive range of Sani-Tech, SaniPure, PharMed & Tygon hose & tubing alongside the BarbLock® retainers to offer a trustworthy & leak-free solution. BarbLock ultra secure retainers are the most advanced design available in today’s demanding connective applications. In contrast to standard Cable Tie solutions, these unique secure retainers are the only system with a full 360° radial crimp behind the barb and 360° of compression directly over the barb’s ridge. They become the standard in many industries, including biopharmaceutical, medical and laboratory, because they solve inherent leak path problems in sensitive and demanding applications. The BarbLock secure retainers use no adhesives or solvents, it is ideal for systems transferring delicate liquids or gases, and is quick and easy to assemble, saving valuable time. To further discuss the BarbLock ultra secure retainers, and how we can help you.